Following are a few of the common mistakes made when creating a candy buffet. Keep them in mind as you work out the details of your sweet table, to ensure a well planned and stunning result! Candy and the glass containers they are held in, are quite heavy and should therefore be displayed on a strong, flat and stable surface. A rectangular shaped table is also much better for a candy buffet than a round shaped table. With a rectangular table your wide assortment of containers can be arranged to provide easy access to each of your candies. Whereas with a round table, it may be difficult for your guests to reach the back row of jars. This is why it's also important to note that containers should never be placed near the edge of a table, yet no jar should be further than 24” from the edge. Don’t make it complicated for your guests to help themselves to your beautiful candy buffet. For ease and symmetry, set the tallest jars in the back, the medium sized in the middle, and smaller ones in front so that everything is easily accessible. For aesthetic reasons, candy jars and containers should not be placed too far apart. However it's also important to leave enough space around each jar, so that guests can put down their self-serve candy cup, safely remove the lid of a jar, and place it on the table while they help themselves to some delicious candy. Select the size and style of your glass jars and containers, in a way that makes it comfortable for your guests to scoop candies. To do this, avoid really tall jars with narrow openings, because these types of containers make it nearly impossible for your guests to serve themselves. As for smaller containers, you can raise them to a more comfortable height, to facilitate serving. Your selection of candy should be attractive and appealing to the eyes and taste buds of your guests. Therefore using commercial wrapped candy will cheapen the look of your candy buffet. The only exception to this, would be for a nostalgic themed candy bar, where wrapped old-fashioned candies fit the mood, and enhance the impact of your sweet table. Placing candy directly on the tablecloth for visual effect is not decorative, it is simply messy. When choosing serving tools, make sure that they are appropriate for the candy that they will be handling. A scoop does not work well for picking up pretzels or gummy candies, just as tongs are inappropriate to pick up small, hard candies. The size of the serving utensils is also very important. 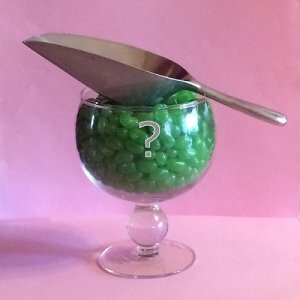 A large metal scoop in a small candy jar is not proportionate, just as a small plastic scoop is not appropriate in a jar filled with large and/or heavy candy. Another thing to keep in mind, is that using metal scoops in glass jars will chip the upper rim of the container and pieces of glass can fall into the candy. Please also note that there is no need to use scoops or tongs when picking up individually wrapped candy. Keep your scoops and self serving candy containers small.... or your sweet table will be emptied in no time. It's also advisable to provide open self serving cups instead of bags or closable boxes, because you may notice your guests filling multiple containers to bring home for weekly snacks. Candy buffets outside in the summer are tricky because candy is highly susceptible to heat. It would be best if you can arrange it, to not have your wedding during the hot peak of the season. However if you are in this situation, be sure to protect your candy by setting the buffet in a shady area. You’ll also need to stay away from candies that are too sensitive to heat, such as chocolate.